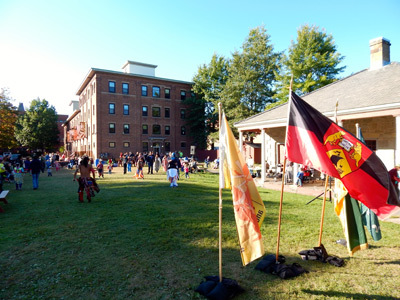 The Ekpahak Powwow Committee will host the Fifth Annual Student Orientation Powwow Sept. 25 from 12 noon to 6:00 p.m. at Officer’s Square in downtown Fredericton. This is a free public event and everyone is invited to attend. Should there be a need to reschedule, the rain date is Oct. 2. The University of New Brunswick, St. Thomas University, New Brunswick Community College and the New Brunswick College of Craft and Design are eager to welcome students by kicking off the new academic year with drumming, dancing, crafts, culture and a feast. The city of Fredericton and all students are encouraged to come out and enjoy the opportunity to watch, listen and learn of the Wolastoqey and Mi’kmaq cultures while creating a sense of community in downtown Fredericton. The powwow will commence at 12 noon with a ceremonial opening prayer and grand entry. The feast will take place at 3:00 p.m. during the “open-mic” hour where everyone is welcome to participate in sharing a song, prayer, poem, flute playing, hand drum, etc. Please keep in mind this event will be videotaped and photographed for promotional purposes. For more information on the Fifth Annual Student Orientation Powwow, please contact Trenton Augustine at (506) 447-3337 or trenton.augustine@unb.ca.